By the early 1860s, the section of road between Brisbane and North Pine via Bald Hills (later known as Gympie Road) was beginning to supplant the Old North Road as the main thoroughfare through the district. 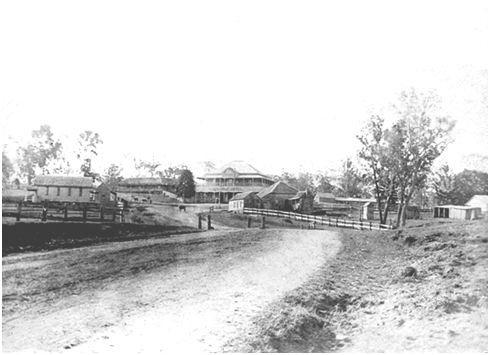 Instead of bypassing the area to the west, travellers were now passing within proximity of Tom Petrie’s Murrumba Homestead. By 1865, increasing demand for a hostelry which could offer a range of services to travellers provided Petrie with the incentive to set up a hostelry and combine this with a store and accommodation house. 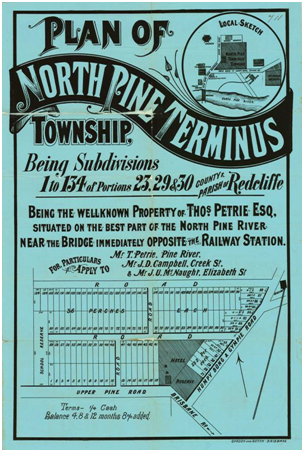 The building, which became known as Tom Petrie’s Accommodation House, was erected near the south-eastern corner of his Portion 29 land on Old Dayboro Road, north of the River Street intersection (near today’s western entrance to Woolworths). It soon became an important centre in the district with the beginnings of a township eventually springing up around it. This developed into the only Pine Rivers settlement of any note during the 19th century. In February 1872, Edwin Willett was granted a country publican’s licence to trade from Petrie’s Accommodation House, which then became known as the North Pine Hotel. Other licencees during the period from 1872 to 1887 included George Buckby, William Holman Berry and Henry Williams. The 1 April 1872 opening of the North Pine Post Office in the same building gave the locality some degree of official township status. For some time it had been used by sundowners as a camping-place. On the evening when the house collapsed there were four of these men, who had their swags laid out for the night’s rest. Hearing a creaking noise they went outside, and had just got out when the building fell in with a crash, burying the swags which had been left behind, amidst the debris. North Pine Terminus Estate, ca. 1886. Courtesy of the John Oxley Library, State Library of Queensland. Brisbane Courier, Tuesday 28 March 1899.